UGI Energy Services, a fuel and electricity marketing company, is connecting its staff with financial benefits from Utilities Employees Credit Union (UECU), including a voluntary staff education program on financial wellness. UECU is a financial benefits provider serving American companies in the energy, utility, and related industries. UGI Energy Services, Inc. is excited to partner with UECU in offering financial wellness seminars to our employees in an effort to support their financial well-being. 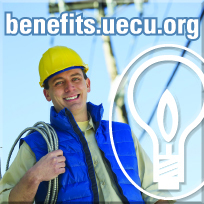 Utilities Employees Credit Union (UECU) is providing energy marketing professionals in the Pennsylvania offices of UGI Energy Services, Inc. (UGIES), with new employee benefits including a financial wellness education program, offered at no cost to their employer. UECU offers energy, utility, and related-industry companies a free voluntary benefit they can extend to workers and their families, to promote financial wellness, reduce company health care costs, and enhance worker productivity. UECU and UGIES began partnering earlier this year to provide UGIES staff with ongoing financial education. UGIES promotes employee wellness through its benefits package and wanted to ensure staff and their family members would also have resources to build financial stability as part of their overall wellness. Given UGIES’ eligibility for UECU membership as an energy / utility company, its human resources division recognized a partnership with UECU would give them a no-cost option for the employee education they wanted to provide. Since April, UECU representatives have provided a series of “lunch and learn” sessions for UGIES employees on topics including: financial wellness strategies, credit scores, building positive credit history, and retirement planning basics. UECU offers partner businesses the option of on-site financial education programs as well as distance education opportunities. In the case of UGIES, its program has blended in-person sessions for employees located in the UGIES Operations Center in Wyomissing, PA, with an online alternative version of its seminars for UGIES staff located in other offices. “UGI Energy Services’ employees are not all centrally located, making educational sessions difficult. UECU provides on-site training from industry experts, which is then shared with all staff across the company by video, ensuring that employees unable to attend sessions still have access to improve their understanding of financial issues,” says Naugle. UECU and UGIES have plans for presentations on a variety of financial wellness topics to continue throughout the year. UECU provides free nationwide access to financial products and services, credit counseling, and financial education to utility and energy workers. The credit union offers additional employee promotions, benefits support, and financial education services to industry companies and professional associations that offer membership as a worker benefit. Some companies offer UECU membership as a stand-alone benefit, while others incorporate it as part of a company financial wellness program or employee assistance program. Utilities Employees Credit Union is a nationwide, virtual credit union providing financial services to utility and energy workers and their families since 1934. Its membership includes the employees of 600 companies and members of Energy People Connect, an association for individuals currently employed or pursuing employment in the energy industry. UECU is among the two percent of U.S. credit unions to receive an A “Excellent” Weiss Rating for financial soundness and one of the few financial institutions to reward its members with a year-end bonus dividend, which last year totaled nearly $1 million. UGI Energy Services, Inc. (“UGIES”) markets natural gas, propane, heating oil and electricity to approximately 30,000 residential, commercial and industrial customers throughout the Mid-Atlantic region. UGIES owns and contracts for a variety of assets used to support the marketing business. These assets include pipeline capacity, underground natural gas storage, electric generation and propane rail terminals.